Caring for an elderly family member can be overwhelming. But fulfilling life experiences are still possible for both caregivers and their loved ones, despite the stress and fatigue of caregiving. 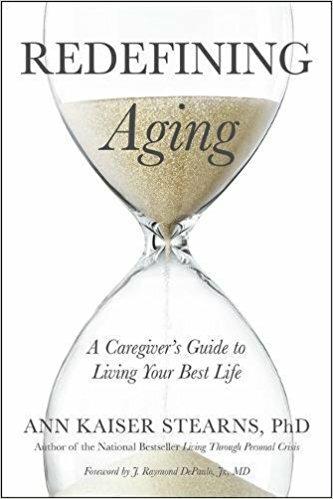 In this comprehensive book, best-selling author Ann Kaiser Stearns explores the practical and personal challenges of both caregiving and successful aging. She couples findings from the latest research with powerful insights and problem-solving tips to help caregivers achieve the best life possible for those they care for?and for themselves as they age. Redefining Aging will help readers think differently about caregiving and their own aging. "A comprehensive guide to the challenges of elder care for family members that is both practical and profound. This book distinguishes itself by its insight into the deeper psychological and emotional challenges of caregiving as well as the sources of resilience that allow some family members not only to meet the challenges of providing care but also to lead a rich, flourishing life." "Dr. Stearns brings her own unique skill set to the drawing board of the caregiving literature and suffuses the pages with expertise in counseling, grief work, and resilience. The main themes of this volume will resonate with caregivers of older adults." "Blending her own experience with those of others and a careful reading of published material, Ann Kaiser Stearns offers a wide-ranging and thoughtful discussion of lessons learned about the joys and challenges of caregiving for a chronically ill loved one." The author of the national best seller Living Through Personal Crisis, published in seven languages, Ann Kaiser Stearns, PhD, is a professor of behavioral science at the Community College of Baltimore County. She has received excellence in teaching awards from the Maryland Psychological Association, Johns Hopkins University, and Loyola University Maryland.